Synology has the DS2015xs and DS3615xs-storage systems announced. Both models are standard 10Gbit/s-ethernetaansluitingen. The DS2015xs supports up to eight hard drives, while the DS3615xs twelve drive bays counts. According to the nas manufacturer can the DiskStation DS2015xs thanks to two 10Gb ethernet ports throughput gain to 1930MB/s at a maximum 59.180 iops. Because the nas also includes two gigabit ethernet ports, this nas system is especially suitable for small businesses that gradually move to 10Gbit want to make, reported, Synology. The processor is the Annapurna Labs Alpine AL514-soc, a quad-core ARM Cortex A15 processor. 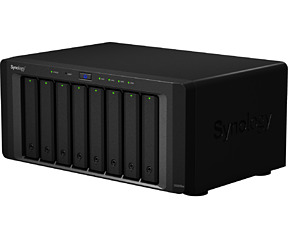 The eight drive bays in the DS2015xs can offer the use of 6TB drives for a maximum gross storage of 48TB. With expansion units, the available storage capacity can still be increased. Furthermore, it contains the nas standard 4GB ram. This is possibly to expand up to 8GB. The DS2015xs is available immediately. The suggested retail price amounts to 1168 euro. Those who need more storage capacity can diverge into the DS3615xs. This nas includes an Intel Core i3-4130, dual-core processor at 3.4 GHz is clocked. The nas comes with 4GB of ecc ram, but expansion up to 32GB is possible. The twelve drive bays offer a maximum gross storage capacity of 72TB, while also a solid-state cachingmechanisme in the storage system is to be found. The DS3615xs comes standard with four gigabit ethernet ports, but Synology also provides a 10Gb ethernet adapter to as throughput rates of more than 2350MB/s. The maximum number of iops is specified at 236.350. The nas system will get a price tag of 2239 euro.